Give Us Your Best Elevator Pitch, Coogs! Two minutes of your life. That’s all we are asking. You could win $1,000. Got a business idea you’ve been wanting to pitch? The Cyvia and Melvyn Wolff Center for Entrepreneurship at the University of Houston C. T. Bauer College of Business would love to hear it. CougarPitch — an elevator-pitch competition open to University of Houston students, faculty and staff — was announced today by Bauer College, home of the nation’s top-ranked undergraduate entrepreneurship program. Deadline for CougarPitch entries is Oct. 31. Finalists will compete in an elevator-pitch slam Nov. 9 at Melcher Hall on the UH campus. Who: Presented by the Cyvia and Melvyn Wolff Center for Entrepreneurship at the University of Houston C. T. Bauer College of Business. 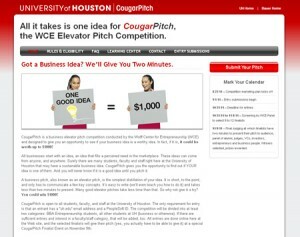 What: CougarPitch, an elevator-pitch competition. Open to all members of the University of Houston family — students, faculty and staff. Top three finalists in each category will take home a cash prize, with first place winners receiving $1,000, second place receiving $500 and third place $250. When: Online entry submission opens Sept. 1. Deadline: Oct. 31. Finalists will make their pitches at a public competition on Nov. 9. Judges will be enlisted from the Houston business community. Where: Melcher Hall, C. T. Bauer College of Business, University of Houston. If you are trying to formulate a pitch, Jones suggests imagining yourself on an elevator on the first floor of a 10-story building. By the time you reach the 10th floor, you should have made your pitch. Don’t be intimidated by the process. Judges, all from the UH business community, will be looking for quality of ideas. For more information about rules and eligibility, and how to submit your pitch when the online entry form opens on Sept. 1, visit www.cougarpitch.com.